3D printing is now being used in a number of applications, but replacing 75% of man’s skull with a plastic prosthetic implant is a ground-breaking first. 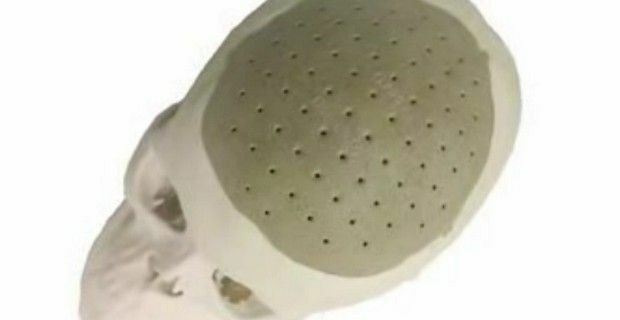 The surgery took place on March 4th on a patient who remained unnamed, as also the medical reason behind the extensive cranial surgery, had 75% of his skull replaced by a custom-designed polymer cranium 3D-printed implant. According to the scanty report, three-quarters of the man’s skull bone was replaced with polyetherketoneketone (PEKK), a biocompatible polymer that won't interfere with X-rays and was specially-designed with ridges and holes in it and is also osteoconductive, which means it encourages bone cell growth. The US Food and Drug Administration granted approval of the 3D-printed implant on February 18 to Oxford Performance Materials in Connecticut, and the company is now looking to spread the technology. OPM, the medical technology company behind the implant says that it can produce the OsteoFab implant within two weeks of obtaining 3D scans of the affected bone area that needs to be transplanted and also states that around 500 injured people per month in the US could make use of the 3D-printed implant technology. Scott DeFelice, president of Oxford Performance Materials, said: "It is our firm belief that this is a highly transformative and disruptive technology platform that will substantially impact all sectors of the orthopaedic industry. We have sought our first approval within cranial implants because the need was most compelling; however, this is just the beginning. We will now move systematically throughout the body in an effort to deliver improved outcomes at lower overall cost to the patient and healthcare provider."